This gluten free cookie cake is baked up in the slow cooker and served warm for a delicious dessert! In a medium-sized bowl, whisk together the flour, baking soda, and salt, then set aside. Add the butter and sugar to a large bowl, or the bowl of your stand mixer, and mix with an electric mixer for about 1 minute, until fluffy. Add the vanilla and eggs to the butter mixture and beat again, until fully combined. Add the flour mixture to the butter mixture 1/2 cup at a time, until the flour is fully incorporated into the dough, then stir in the chocolate chips. Line your slow cooker with parchment paper, then press the dough into the slow cooker in an even layer. Cook on high for two hours, until the edges and top of the cookie are browned and the center is still slightly soft. Serve immediately with vanilla ice cream, or turn the slow cooker to warm to eat later. In a medium-sized bowl, whisk together the almond flour, arrowroot, baking powder, baking soda, and sea salt. In a large bowl, beat the butter and coconut sugar with an electric mixer until fully combined, then add in the cashew butter, eggs, and vanilla, and mix until well incorporated. Add the flour mixture into the wet mixture 1/2 cup at a time, beating constantly, until fully combined, then stir in the chocolate chips. 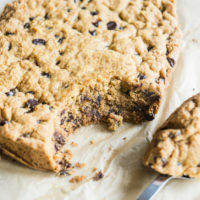 If you’d prefer to bake the cookie cake: press the dough into a 9×13 inch pan and bake at 325 F for 45-50 minutes, until the edges and top of the cookie are browned and a toothpick comes out clean.